Troopers Hill抯 geology is unusual in Bristol. Much of the city lies on Carboniferous Limestone, but Troopers Hill is dominated by sandstone of the Pennant Measures which are sedimentary rocks formed in tropical swamps some 300 million years ago. In places, the sandstone can be seen on the surface, both as natural outcrops and old quarry faces. The combination of sandstone and local industry has resulted in acid soils, which are rare in Bristol. This has encouraged a wealth of plants to flourish, that are found nowhere else in the City. Much of the shape of the hill is the result of quarrying for the sandstone which was used as building stone throughout Bristol. The largest quarry was the gully in the centre of the hill which was worked until the end of the nineteenth centuary. The humps and bumps above Troopers Hill Rd are where the unsuitable stone was tipped. As well as sandstones the Pennant Measures include mudstones, shales, clay and coal seams. In the past coal has been dug where it outcroped on the hill and both fireclay and coal have been taken from deep mines under the hill. The importance of Troopers Hill as a geological site was officially recognised in April 2010 when Troopers Hill was designated as a Regionally Important Geological and Geomorphological Site (RIGS) these are now also known as Local Geological Sites. 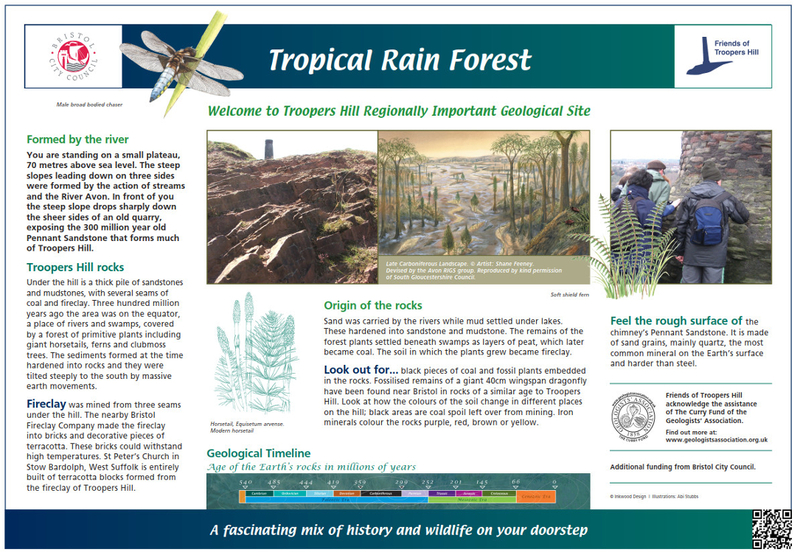 More information on the 300 million year history of Troopers Hill is available in our 'Hill Geology' Leaflet which is available via the link below. Friends of Troopers Hill were awarded �000 from Bristol City Council to provide the new board in early 2016. This was part of a project to help promote greater enjoyment and understanding of Bristol's Local Nature Reserves. Friends of Troopers Hill then worked with Andrew Mathieson (see below) and the Avon RIGS Group on the design and wording of the board. It became clear that we could produce a much more informative and attractive board if we could add additional funds. On Andrew's suggestion, we sent our initial draft to The Geologists' Association with an application to their 'Curry Fund'. We were very pleased to be awarded a grant of �380 which added to the money from Bristol City Council means we could procede with the design and installation of our new board. 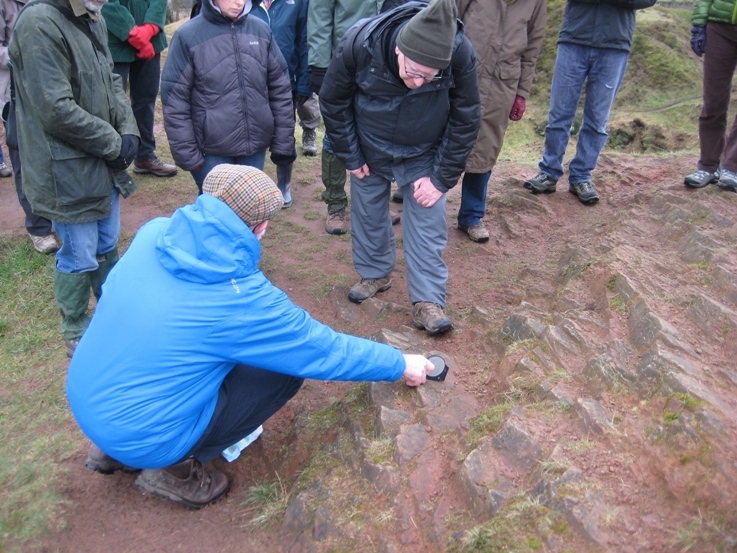 Andrew Mathieson who led guided geology walks on Troopers Hill in February 2013 and October 2016 has produced a short document describing the rocks of Troopers Hill that can be downloaded from the link below. Andrew led the walks and wrote this information on behalf of the Avon RIGS Group, which helps to conserve local geological sites (including Troopers Hill). The wildlife found on the Hill indicates that the soils are acidic, but untill recently they had not been tested. In 2012 a sudy into the soils on Troopers Hill looking at both the acidity and contamination by heavy metals in was carried out by a student from Plymouth University, Rebecca Beighton BSc Hons. 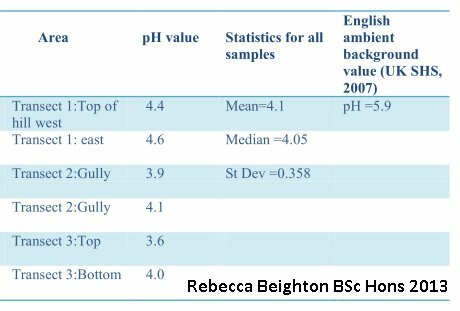 The study confirms the soil pH to be extreme acidic in nature. There is contamination by Copper and Arsenic concentrated around the chimney but not at levels that need any remediation work. Rebecca has kindly allowed us to post the finished work on this website and it can be seen via the link below. The rock face at the end of the gully clearly shows how the layers of rock have been tilted due to various movements in the earths crust during the hill's 300 million year history. Geomorphology is the science concerned with understanding the form of the Earth's land surface and the processes by which it is shaped, both at the present day as well as in the past. British geomorphologists are involved in research into the processes of weathering and erosion, sediment transport and deposition, the characterisation of landforms and the materials of which they are composed. You can learn more about geomorphology at www.geomorphology.org.uk and about Geology at the British Geological Survey website.